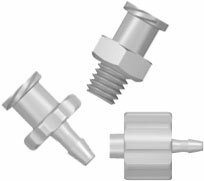 Our low pressure fittings are ideally suited for flow injection analysis, low pressure liquid chromatography, and stream sampling devices. They may be safely used at pressures up to 500 psi and temperatures to 50°C. 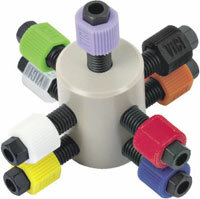 Color-It fingertight adapters fit all our PEEK 1/4" hex-head nuts. 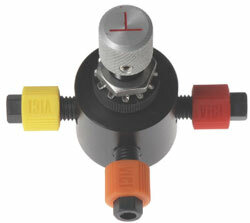 Color-Sleeve adapters are designed to be used with our black PPS nuts. Simplify your liquid or gas handling application. The unique design of the fitting detail allows a leak-free seal with no potential for rotor damage from overtightening. Connect soft tubing to PTFE and PTFE-like tubing with this biocompatible adapter set, which works with peristaltic tubing up to 4.50 mm OD. A wide offering of adapters, including male and female Luer to barbed, 10-32, and 1/4-28 male and female, plus many other combinations.